I thought you might like to see how other readers are responding to my book. My friend, she loves it very much..the lessons from your life stories are just so down to earth that we felt as u shared in your book…it actually speaks into our lives.. cos’ all of us one way or another have something that we felt..like your book title………………………………. 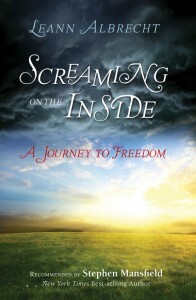 “SCREAMING ON THE INSIDE” IS NOW AVAILABLE!! I love this book. Leann really shows her heart, her mind and following Jesus despite mistakes, sin, and all the emotions involved. She is a strong woman of God and I highly recommend reading it. Thank you for your encouraging words, Pam. I am so glad my book was inspiring to you!